Portholland Bed and Breakfasts. Compare latest rates and Live availability for all your favourite places and places you have always wanted to go using our new My Shortlist feature. Click + to add to your Shortlist. Bed and Breakfasts in Portholland, Cornwall for 1 night from Wed Apr 24, 2019 to Thu Apr 25, 2019 within 10 miles, in an Average Nightly price range of £1 to £200. Lugger Hotel â€˜A Bespoke Hotel' is a unique 17th-century inn, idyllic escape right on the water's edge, in the fishing village of Portloe on the Roseland Peninsula. Its 2 AA-Rosette awarded restaurant with sunny terrace overlooks the harbour and serves fresh seafood and local produce. Set over 3 separate buildings around the harbour, each room is individually decorated and has a luxurious en suite bathroom with shower. Portloe is in a conservation area at the foot of a valley and offers a picturesque cove and a tiny harbour to explore. Guests can drive 16 miles to the Eden Project, 8 miles to the Lost Gardens of Heligan or 23 miles to visit the National Maritime Museum Cornwall in Falmouth. We offer B&B in our Victorian farmhouse which is also our family home. We have 4 guest rooms each offering tea and coffee making facilities fridges clock radios hairdryers televisions and wifi. The farmhouse is furnished and decorated in a style suitable for a Victorian farmhouse but with modern comforts included. br / br / br / br / Room 1 is a large family room with one double bed and full sized bunk beds for the children or a single bed if you would like a twin room. It has an en suite shower room. br / br / br / br / Room 2 is our newly refurbished premium room it has a super king size bed or this can also be configured as a twin bedded room with SMART TV oak furniture with armchairs new en suite shower room and lovely views over the front garden. br / br / br / br / Room 3 has also been newly refurbished and is a double aspect family room with private bathroom adjacent. There is a double bed and full size bunk beds. The bathroom has an L-shaped bath with shower over as well as toilet and hand basin. br / br / br / br / Room 4 is a lovely double room with en suite bathroom at the side of the house overlooking farmland. br / br / br / br / There s plenty of parking and guests are welcome to visit the animals or relax in the garden or on the patio. There is a guest lounge which is available throughout the day and a separate guest dining room. We serve a full Cornish or a Continental Breakfast here around our huge antique dining table. br / br / Our farm is a mixed farm of some 250 acres we farm beef cattle and produce some arable crops there are also a few cats and dogs to greet you. We are just 3 miles from the South West Coast Path and sandy beaches of Carne and Pendower which join at low tide and are pet friendly throughout the year. Fantastic attractions such as The Eden Project and the National Maritime Museum are within easy reach as are many beautiful gardens including The Lost Gardens of Heligan and Caerhays Castle for which we can supply discounted tickets. On Cornwall's beautiful south coast, this stylish new hotel is just 2 minutes' walk from Gorran Haven Beach. The Llawnroc Hotel features a restaurant, a sun terrace and luxury rooms with free WiFi. The spacious rooms have bathrobes and fresh ground coffee. Some rooms have sea views, and all are decorated with bespoke artwork and handmade furniture. A full English breakfast is included in the room rate. The Gwineas Pub offers Cornish ales, fine wines and classic cocktails in elegant surroundings. 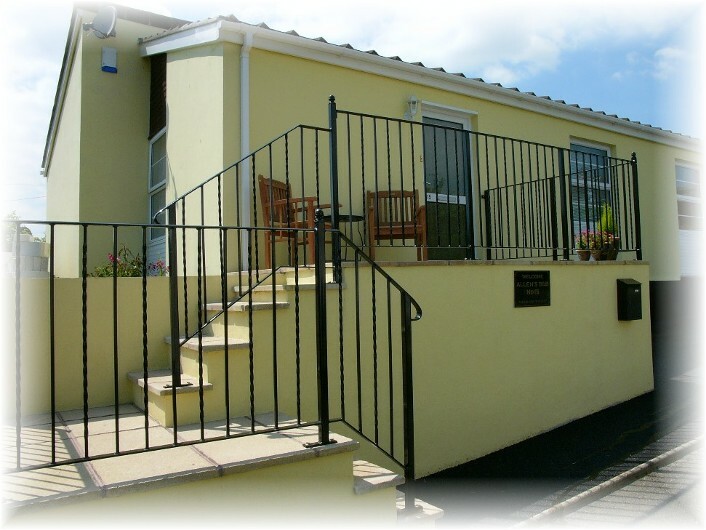 The Llawnroc Hotel is situated in the peaceful village of Gorran Haven, the gateway to the stunning Roseland Peninsula. There is free on-site parking, and the Eden Project can be reached in a 30-minute drive. Karen & Dominic McVeigh offer you a warm welcome to their vintage inspired B&B situated at the heart of the picturesque harbour village of Mevagissey in Cornwall. Holly Cottage endeavors to offer a rare opportunity to stay in a Cornish fishermans cottage packed with character and quirky charm . br / br / This is also complimented by candelit breakfast with vintage china linen and silverware. br / br / We offer three bedrooms our Heligan Room with a double four poster bed with ensuite shower room Hemmick family room packed full of original features with a spacious en suite bathroom with bath and our Eden Room (not suitable for guests with mobility related issues) which has twin beds and a private adjacent bathroom. br / br / br / br / Holly Cottage dates back to 1710 and has all the character of a Cornish cottage low beams uneven floors feature fireplaces exposed walls and window seats. br / br / A homely experience awaits you with an emphasis on quality and a warm welcome. br / br / br / br / The house has a homely feel and is tastefully decorated with painted floorboards and vintage inspired china and d�cor. br / br / br / br / Dogs are welcome at Holly Cottage at a surcharge of �10.00 per stay. br / br / br / br / Guests have their own keys and have access to the house at all times. br / br / br / br / Discounted parking rates with Willow Car Park. Holly Cottage Vintage B&B is located in Mevagissey. Complimentary WiFi is featured. The bed and breakfast offers a seating area with a flat-screen TV and a private bathroom with free toiletries and shower. A continental breakfast can be enjoyed at the property. Newquay is 35 km from Holly Cottage Vintage B&B. The nearest airport is Newquay Cornwall Airport, 33 km from the accommodation. Wild Air Guest House is a period property that boasts magnificent views of the fishing village Mevagissey, St Austell bay and the coastline as far as Plymouth. Each guestroom is light and airy, beautifully furnished and all enjoy the stunning views of the surrounding area. Each room has seating in a bay view window with binoculars provided, a TV with DVD player, hairdryer, tea/coffee making facilities and a clock/radio. The comfortable beds have feather duvets with Egyptian cotton bedding. The stunning breakfast room also takes in the view. Guests share a large table to enjoy a selection of local food, plus great conversation and service. Wild Air Guest House has a beautiful garden and patio for guests to enjoy with drinks chilling facilities available. WiFi is complimentary, as is onsite parking for all guests. Situated in the pretty fishing village of Mevagissey, overlooking the bay, this boutique hotel has steps down to the secluded beach. There is free Wi-Fi throughout the building, and free parking on site. Featuring old oak panelling and luxurious designer fabrics, log fires, and a collection of paintings, Trevalsa Court Hotel offers cosy and unique accommodation. Most rooms have beautiful sea views, and all feature a TV and an en suite bathroom with free toiletries. Fresh fish and local meat feature on the menu in Trevalsa Court Hotel's elegant oak-panelled restaurant. Guests can also dine on the terrace, which looks out across the English Channel. Fishing and boat trips are available from the harbour, which is just a 10-minute stroll down the coastal path. South Cornwall is an Area of Outstanding Natural Beauty, and the surrounding countryside offers plenty of opportunities for scenic walks. In 43 acres of parkland, this stunning 19th-century manor house has a luxurious spa, a gym and an infinity pool. It offers a range of accommodation just a few miles from The Eden Project. Guests have free use of The Clearing Spa, with facilities including a bubble pool, a sauna and a steam room. Guests can enjoy a game of tennis on the hotel tennis courts. The Cornwall Hotel Spa and Estate provides luxurious rooms with flat-screen TVs and free Wi-Fi. Self-catering Woodland lodges are also available. The Restaurant offers a relaxed dining atmosphere. It has been awarded an AA Rosette for its food, with dishes made using local produce. Guests can also enjoy a selection of sharing and locally inspired dishes in the bar, or dine al fresco on the terrace. Architecturally designed spilt-level house with three double rooms two sundecks one with outside fireplace and BBQ area large residents lounge with 55’ HDTV and free Wi-Fi. Off-road parking available. We are a 12 minute walk to the town of St. Austell where there are several pubs five screen cinema restaurants bowling alley and various shops. St Austell is best location as it is central for travelling throughout Cornwall. On our doorstep is Lost Gardens of Heligan and Eden Project.